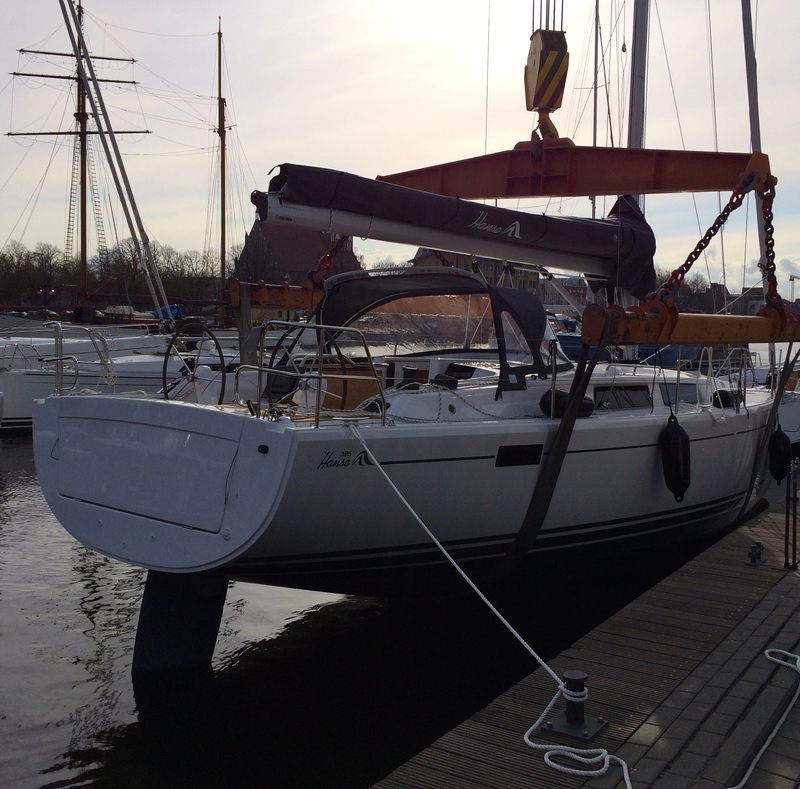 Today we met our new sailing yacht, a Hanse 385, that we’ve named Interlude I. We left the ultra modern Hauptbahnhof station in Berlin and arrived three hours later at the tiny station of Greifsvald. The trip was pretty uneventful and the landscape was similar to back home in Lincolnshire, flat with plenty of agriculture and scrubland. We simply couldn’t wait to get there so the hours dragged on and on. From the station we dropped our bags at the nearby hotel and quickly walked down to the marina, past two fields pack full of Hanse yachts and the Hanse factory. We we greeted by Richard and Andy, from Inspiration Marine, the UK dealership. After a brief introduction they took us down to the jetty. There was Interlude, all shiny and new gleaming away in the sunshine! It was a very surreal and strange experience and I don’t think it will sink in for a while that she’s really ours. In fact, it wasn’t until Richard said “You can go on board you know, she IS yours” that we even left the dock and hopped on. Down below it became more real – she was exactly as we’d chosen. All in all it was very exciting, you couldn’t wipe the smiles off our faces. 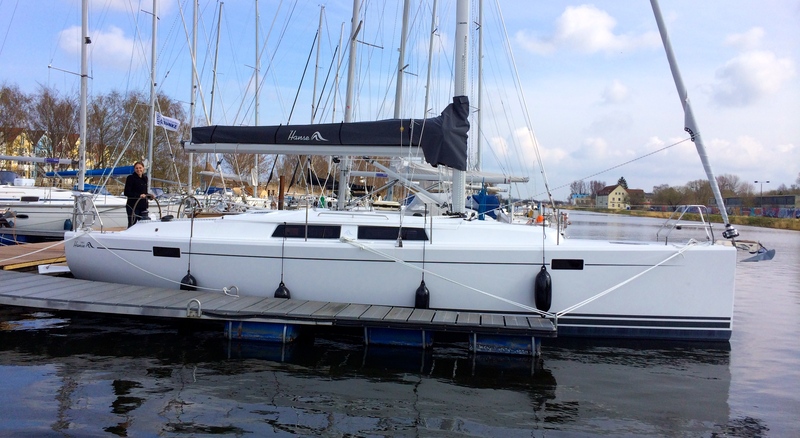 On Tuesday we did the test sail as part of the handover. Once Andy had her out of the marina he handed the helm over to me. Yikes! We motored down the canal, which was very picturesque with geese and other birds taking flight on our approach. We got to the swing bridge that marked the end a couple of minutes early so had to hang around for a little while, but right on time two little men appeared and opened the bridge to let us through. Very windy miller! The opening wasn’t that huge so I was very cautious, but we made it out of the canal in no time. Once in open water, the guys ran through a few checks including the calibration of the autopilot. It was the first time I’d seen an autopilot in action and as part of the test it swung us to port and starboard in increasing increments. As we were doing this, we started to get closer and closer to some fishing buoys which was a bit alarming. We were just about to cancel the whole operation, but Andy held firm saying ‘It’s getting into the really big swings now so we should be nearly there!’. True to his word, and just in the nick of time, the calibration finished and we were able to steer away. Phew! After that it was time to get the sails out. They looked great! The engine was shut off and we tacked around the bay for a while. It was pretty cold though so we were all keen to get back. Simon took us back to the marina and had a chance to test Interlude out for himself. Judging from the huge goofy smile on his face he was very happy. On Wednesday we spent our time at the marina going through some more paperwork and checks. There were a few things we’d spotted (which we were told we would), like a scratch in the one of the floor boards which Hanse promised to fix. Also the hatch on the cabin roof had a vent in it which was not on the original spec. All small things and the support from the guys was spot on. The Volvo guy came to take us through the engine and do the sign off on that. It was all going well until he spotted a small drop of water. Then after a few uums and ahhs he said ‘Up, up’. 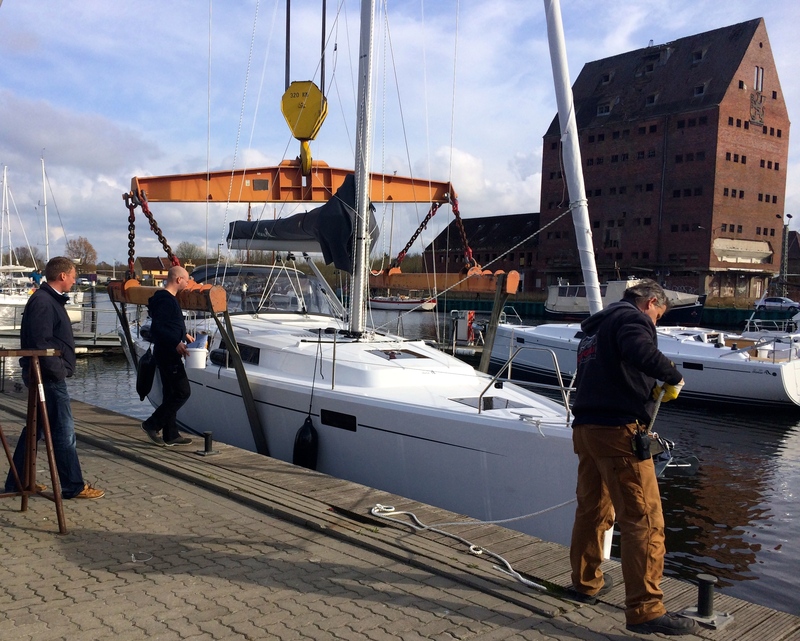 There was a small leak which means poor Interlude had to come back out of the water and have the seal refitted. At about the same time, the guys turned up to fit the spray hood. Work began swiftly and then before we knew the boat was heading off and away to the crane to be lifted out, with the guys still working away on the hood! There was a tense half hour where Interlude was craned out. We hung around to watch but it was very nerve wrecking. She didn’t come all the way out of the water but just enough for the seal to be above water and refitted, then with great efficiency she was back in the water. 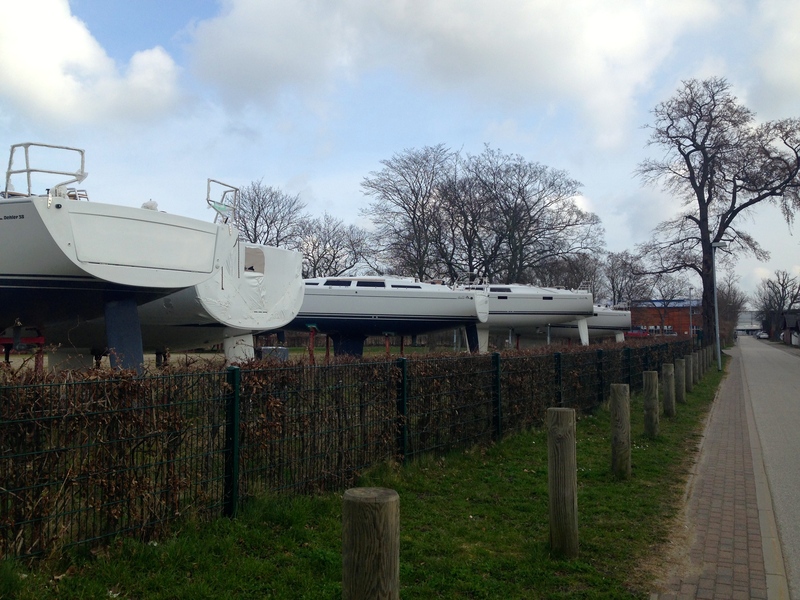 With so many boats lined up on the manufacturing line, these guys don’t hang around. Later on Richard and Andy were kind enough to drive us down the road to the local supermarket. Tomorrow we will be living on board so we needed to pick up some essentials – like a heater and a kettle. The afternoon and nights get very nippy as a cold wind picks up so I’m sure we’ll be needing those. On Thursday we moved out of our comfy hotel and onto our brand new yacht. I never thought this moment would come! We dragged all our bags down to the marina and onto our boat. There are not too many home comforts here at the moment due to the measly baggage allowance but it was good to start making it our own. That afternoon we ran around town to Aldi and Netto (and Dog Netto??) to pick up a few more bits and pieces we would need for the trip. We also hunted through the local outdoors and camping shops. By the end of the day we were pretty worn out so we headed into town for some well earned beers and pizza. 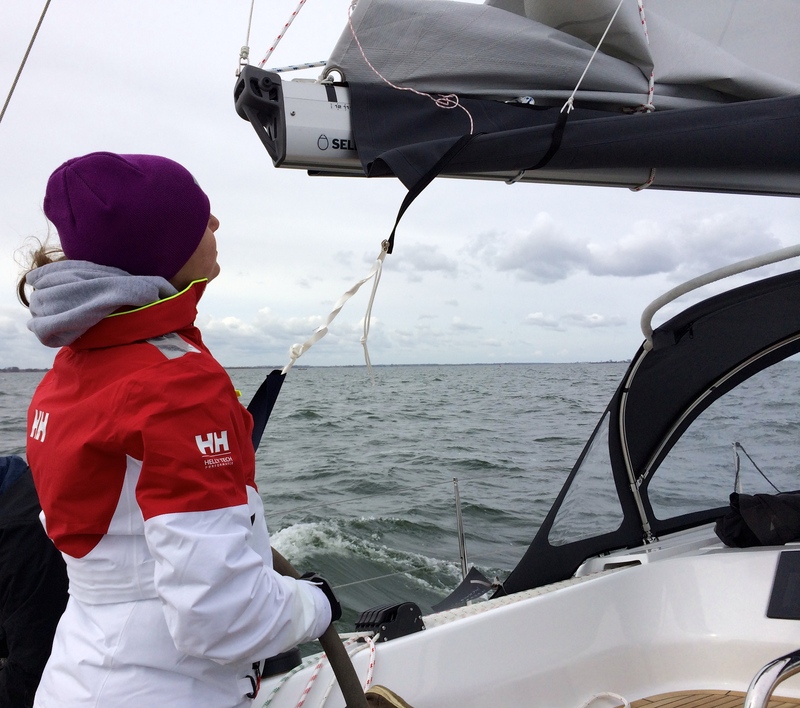 On Friday we woke to a cold boat and realised that our departure date was getting close. It was very exciting but also extremely scary. The morning was taken up with more chores, the chandlery, the supermarket (again) as we tried to get Interlude ship shape. We wanted to make a good impression on the deliver crew from Halcyon who were due to arrive. When Jamie, the skipper, stepped onboard we were still racing ahead to get our preparations complete. After a quick welcome, we ran through some safety checks and then headed back to the chandlery for some more supplies, including flags, a life ring, Jon buoy and the jack stays that we’d ordered the day before. The rest of the day was spent with yet more preparations and before we knew it that cold afternoon wind was blowing through which could only mean one thing – time to head to the pub. We had dinner with Richard and Andy (Inspiration Marine) and Jamie and Peter (Halcyon). It was great to chat with an amazing bunch of guys, who all seem eager to help us on our way. Richard and Andy have helped us no end and now we will be in the capable hands of Jamie and Peter. Any time you have drinks with sailors the talk usually ends up with sailing bloopers, and I could only hope that, as green as we are, we won’t be making too many of those! But time will tell. The next morning we’d be setting off for our journey back to old Blighty. 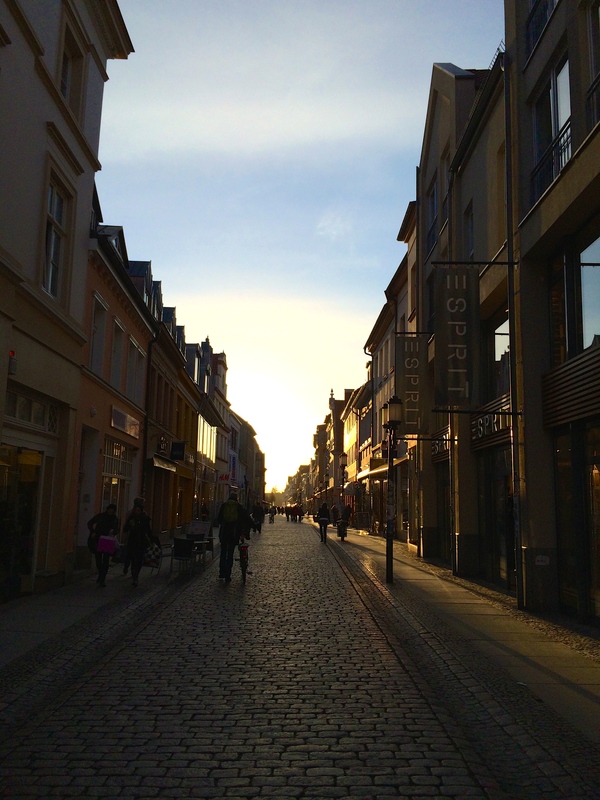 This entry was posted in Germany by Helen. Bookmark the permalink. It’s a lovely trip. We went very early (March) and were lucky with sunny blue skies for most of it. But then some Fog also. The last day coming into Southhampton was the worst weather actually. 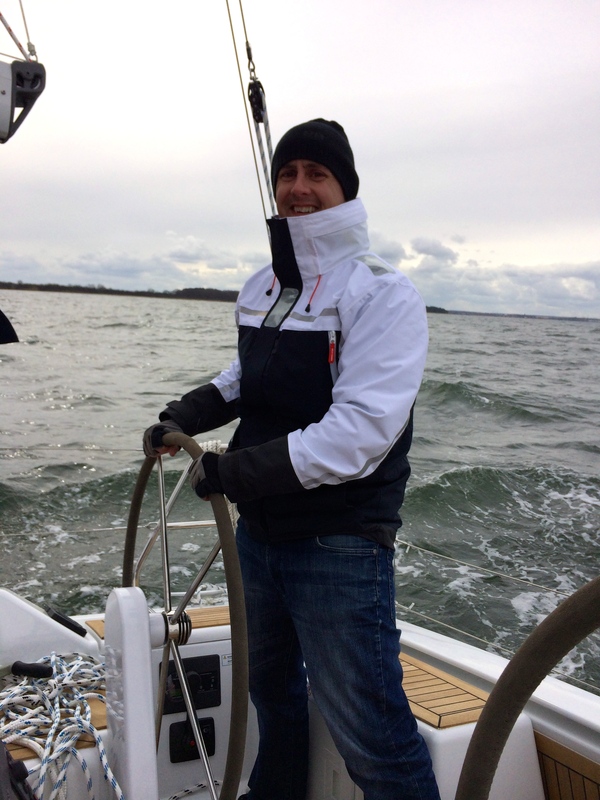 We did use a delivery skipper for the trip (as we were new and wanted experience). If it’s your first time off-shore I can pass over his details if you want. Couldn’t ask for a better person.